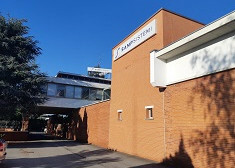 Founded in 1936, Sampsistemi represents the oldest company of the SAMP Group. We have been working every day to offer better wire engineering solutions. Alongside with clients we have researched, designed and developed new lines and systems. Starting from the steel wire production, we have anticipated the market trend moving our focus to the copper and today to the aluminum wire and cable production. At Sampsistemi clients’ needs are our focus and their targets of efficiency, productivity, flexibility, sustainability are our priority. 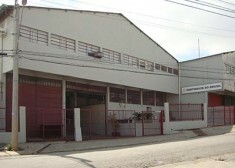 Our systems and lines are designed and developed in order to maximize the production of wire and cable. In doing so, building a stable and trustful relation is a priority as well as sharing expertise and knowledge. At the same time we have also paid special attention to the development of patented technologies making up for considerable savings on the whole manufacturing process. The end result is wire and cable, produced to the tightest tolerances with minimum waste of resources. 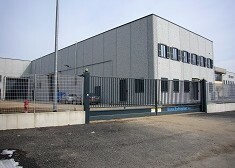 We do not sell single products, but we offer high-quality solutions in order to maximize your profit. 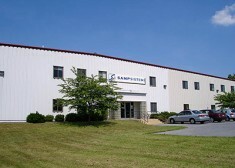 Sampsistemi has always invested in technology and training in order to build stable and high-skilled teams of engineers who are able to offer clients the best possible solution. Our range of solutions stretches from the wire drawing to the extrusion and bunching. Our development strategy for wire drawing equipment has anticipated market trends when it comes to energy savings and top-level flexibility. Sampsistemi extrusion equipment completes the product range of wire drawing and bunching equipment to form a homogeneous, worry-free manufacturing line, from the rod to the finished cable. Our extrusion lines are characterized by top process stability at high production speeds and guarantee minimal energy dispersion. Our wide range of extruders is designed to process all common types of insulation materials, ensuring you superior flexibility. At Sampsistemi, we like to assess clients’ needs under a holistic view in order to offer a more efficient and high quality solution. All customers are treated as unique despite their size and importance on the market. In this view, we design and supply stand-alone machines or complete lines to suit their complete wire production reality. 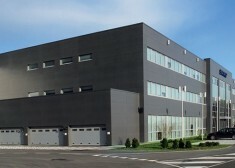 We have a stable worldwide presence with 4 subsidiaries, 3 production plants and nearly 250 employees operating in five continents ensuring tight relations with the customers strengthened by a reliable and prompt customer service and spare parts department. Furthermore, we have strengthened our presence in the market thanks to three strategic acquisitions: Euroalpha, Cortinovis do Brasil and Euro Extrusion. We believe that a successful product is the result of ongoing researches. In doing so, we listen our clients’ needs and invest on innovation and technology, offering them a better mechanical engineering solution. Beyond precision is our motto. We believe in the importance to raise the bar pushing the limit of innovation further. Beyond precision is our mindset in offering you the best solution ensuring competitive advantage and a concrete return of investment. In doing so, the share of expertise is a pivotal step on which our strong and trustful relation with clients is built. 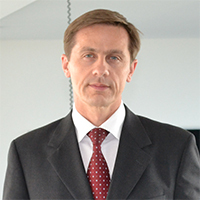 The management of Sampsistemi is made up of a strong team, thanks to the combination of experienced directors and high-skilled professionals specialized in their own field. In this way it is possible to manage a truly global company. Thanks to our geographical expansion, we are never so far from you. 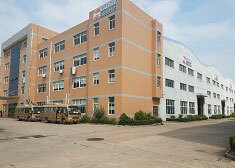 We manufacture in 3 continents most of the world. Knowledge and innovation are the two key words that have marked our history and expansion. We never stopped and our business started with the steel drawing machines, it evolved and expanded its border to bunching and extrusion machines as well as different raw materials. Our know-how is based on a strong combination of innovation and knowledge. Throughout our years of history and by working in different countries for different industries, we gained a strong amount of technical expertise, market knowledge and experience. We strongly believe that, especially today where the competition is extremely challenging, knowledge is a great competitive advantage for companies to triumph among competitors. Clients are the centre of our focus and help them win their competition leading their market by sharing our broad knowledge and expertise has always been our value. Our knowledge is constantly fed by our network of local companies and strategic partners, by sharing their own knowledge. All Sampsistemi employees are part of a great network which has been built day by day . A network where they can find updated information and relevant experience in order to provide the best cost effective solution to clients requests. 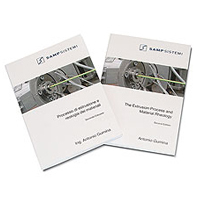 As part of the SAMP Group, Sampsistemi has access to a further bulk of mechanical engineering information. Thereby, our employees have a great holistic view on the business, which plays a key role in offering the best answer to our clients’ specific requests and inquires. The Extrusion Process and Material Rheology is a useful tool for those that want to get a deeper insight into plastic trans formation technology in that it presents the reader with both consolidated notions and new developments, supported by empirical and experimental evidence. The extrusion process and the design of machinery and equipment cannot be detached from material rheology and an in-depth knowledge of plastics technology. 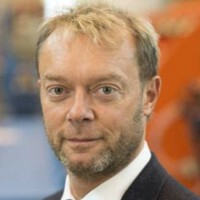 The topics dealt with in the book range from the rheology of plastics to the extrusion process, from different types of extruder screws and barrels to the tool calculations to use for different polymers, and gives an insight into extrusion crosshead calculus. The material in process, the cable and its section at the crosshead inlet, the desired results, the type of process, line speed and other empirical factors all very much influence tool choice. Correctly sizing tube tools, for example, depends on what process is used and on the DDR and DRB values associated with a particular polymer. The DDR and DRB are closely linked to polymer elasticity, to its elongation percentage and to shear rate and shear stress during extrusion. This can also be interpreted as a relation between the speed with which material exits the tool set and the line speed, related then to end product diameter requirements. Tool sets must be well-suited to the polymer in process, to the type of cable to insulate or jacket and to the process itself (insulation, jacketing, filling, etc.) since they can bear tremendous influence on end product quality in terms of surface finish and physical and mechanical properties. Equally important, if not essential, are the notions behind mixing screws, barrier screws, mixed-conformation screws, simple compression screws and the new GA multimaterial screw, which are analysed mathematically in relation to market and customer manufacturing requirements. Order here. Please give the desired quantity, shipping and billing address. Please note that books will be shipped after receipt of payment (or copy of bank transfer slip).